Explore Vietnam at its best through this amazing 17-day tour, which will bring you to all major highlights from the North to the South. Experience old and new features of 2 biggest cities in Vietnam – Hanoi and Ho Chi Minh City, enjoy poetic beauty and gain deep insights into a part of Vietnam’s history in ancient city – Hue or challenge yourself with kayaking in one of the World Heritages. It will be the best trip ever in your life! Warmly welcomed by our tour guide and driver, then we transfer to our hotel. Being a capital of Vietnam for over one thousand year, Hanoi has been gone through ups and downs of a nation. Nowadays, Hanoi is the center of history, culture, economy and politics, etc. of Vietnam. Besides, Hanoi is also a harmonious combination between fine values of tradition and modern features of a developing city. The rest of the day is leisure time for us. Overnight in Hanoi. Full day of exploring outstanding Hanoi’s attractions with antique features of long-standing city, a different view to Hanoi which is changing its look everyday and experiencing as a truly Hanoian. Morning itinerary with bike tour starting from West Lake (Ho Tay). Known as green lung of the whole city, West Lake is the largest lake in Hanoi. Escape from noisy streets, we pedal our bicycles around the lake and enjoy the fresh air of the early morning and peaceful landscapes before visiting well-known historical sites surrounding the lake including Vietnam’ oldest pagoda, Tran Quoc and Quan Thanh Temple – one of the most sacred temples in Vietnam. Along the way, we stop to visit an ancient pagoda to get more insights into a different religion – Buddhism and a lakeside coffee shop to have a break and enjoy a drink before continue our trip. In mid-morning, transfer by car to Temple of Literature, we set foot to the first national university of Vietnam built from Ly Dynasty (1009-1225). At present, apart from a place to worship Confucius and scholars with 82 stone Stelaes of Doctors shaped like turtles, Temple Literature is also a well-known sites attracting both Vietnamese and international tourists to visit. According to Vietnamese’s idealistic concept, they believe that visiting Temple of Literature before taking important exams will bring them good luck. Besides, during Tet Holiday, Vietnamese also come to this temple to receive best wishes about their family, health and career, etc. in Han characters written by calligraphists. Have lunch with Vietnamese traditional dish – “phở” (noodle soup) and then enjoy some tasty desserts like fried rice and sticky sweet treats in Trang Tien Street where were filled up with many narrow alleys and food stalls along streets. 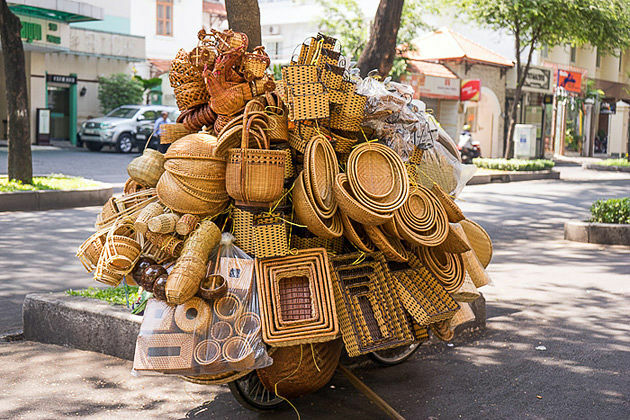 Afternoon sightseeing with tour guide introduce us about Hanoi’ contemporary features including favorites attractions of youngsters like Hanoi Creative City and The Yard. Located in 6 floors of a building, Hanoi Creative City is a combination of entertainment zones, food and beverages zones and shopping zones created by young Hanoian. Discover youthfulness and eventfulness which we can find through unique work of art in walls and old containers or fairs taken place annually in there. Similarly, The Yard is also a combination like Hanoi Creative City but built in Western style with imitation of London’s Shoreditch and Borough Market. Leave those splendid sites, we visit Manzi Art Café – part nice café and bar, part cool art gallery in an ancient French villa to enjoy authentic taste of Vietnamese coffee or glass of wine and contemplate paintings, sculptures and photography before walking to Old Quarter which is not too far from here. At Old Quarter, we start exploring hustling and bustling atmosphere and daily life of local people in the most eventful streets in Hanoi with narrow alleys intersected like a maze and a thousand food stalls, street vendors, traditional workshops, souvenir shops, restaurants and pagodas located alternately together. Interestingly, each street is named by kind of product sold. For instance, “Hàng Bạc” sells silver stuffs, “Hàng Bông” sells cotton quilts, etc. End the tour by enjoying cool fresh beer in Ta Hien Street – one of the most famous streets with foreigners in Hanoi. Back to hotel and have a rest. It is up to us if we would like to explore more Old Quarter. Then, we can pick a taxi to return to our hotel. Overnight in Hanoi. Our morning is at leisure. Start our Walking Street Food Tour this afternoon with local guide takes us around the city to explore and enjoy Hanoi cuisine. Being famous for unfussy ingredients and subtle tastes, Hanoi traditional food always contains unique features that can not be mistaken with cuisine of other regions in Vietnam. At first, let’s enjoy authentic taste of the most Hanoi traditional dishes including “Bánh Cuốn” (Hanoi Rice Rolls), “Chả cá Lã Vọng” (La Vong fried fish dish) and “Phở” (Noodle Soup). Absolutely! After have a rest, continue discover a very different side of Hanoi by walking around tiny streets where are quite and peaceful totally in contrast with crowed streets out there. Back to Old Quarter when it gets dark, listen to our guide introduces us Hanoi’ history and culture and have chance to taste an unique kind of drink named “Egg Coffee” made from egg yolk, coffee blended with milk and butter. Before back to hotel, we have few hours to enjoy Water Puppet Show – a Vietnamese traditional performance in the late afternoon or evening. Overnight in Hanoi. Head to the Northwest within 3 hours driving, we will discover Halong Bay in next 3 days. Located in the Gulf of Tonkin, Halong Bay is a mighty masterpiece by Nature with over 1,600 limestone islands and islets emerging from the blue sky. Its name means “descending of dragon” derived from a legend of local people in a thousand years ago. To help Vietnamese people defend foreign aggression, Gods sent a family of dragons into this region. The dragons spat out gemstones to create long and consistent wall rising from the sea to barricade the enemy that helped Vietnamese people gain victory. Have lunch after embarking then take a short rest. Next, our boatman will take us go deeper into the bay to enjoy majestic scenery with thousands of unique limestones such as a pair of chicken standing together (Trong mai islet), an old fisherman (La Vong islet) or an eagle looking for food (Dai Bang islet), etc. In the middle of the trip, we disembark and try using smaller boats or kayaks to explore many beautiful and mysterious grottoes and caves or floating fishing villages by ourselves. The cuisine will be one of the highlights of our cruise with tasty seafood. On the boat, we also have dining cabin and bar where we can have fun and socialize with other tourists. Besides, the cruise has private balcony to give us space to enjoy the beauty of landscape without distracting. Each junk operates a different itinerary and on board facilities vary. Consultant will be very happy to discuss each option with us. Continue discovering Halong Bay today, our boatman will take us to more beautiful and untouched areas of the bay. Itinerary will be depended on our chosen junk. Besides, we will take more physical activities with swimming and kayaking and have chance to explore some islands around Halong Bay. Overnight on board. Wake up early and relax ourselves by enjoy fresh air, listen to the sound of hundreds of sea birds nesting on the tree in the limestones and stretch our body with Chi Tai exercises (only available on chosen junks). Besides, we can join in cooking class to know how to cook some simple Vietnamese traditional dishes. Enjoy the rest of the morning while the cruise turn back to mainland where Halong Bay trip ends. Transfer to Hanoi for departure flight to Hue. When arrival, check in our hotel and overnight in Hue. 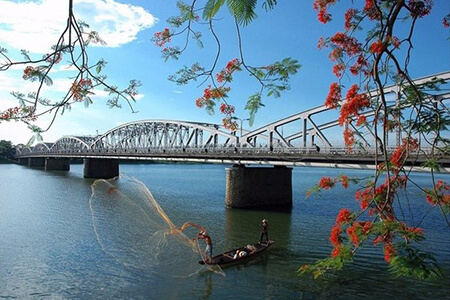 Our trip begins from a part of Hue formerly known as “New City” to another part “Old City” where is separated by Truong Tien Bridge built by famous architecture – Gustave Eiffel. Here, visit heavily bombed remains of the Imperial Citadel and Forbidden City built by Nguyen Dynasty (1802 – 1945). 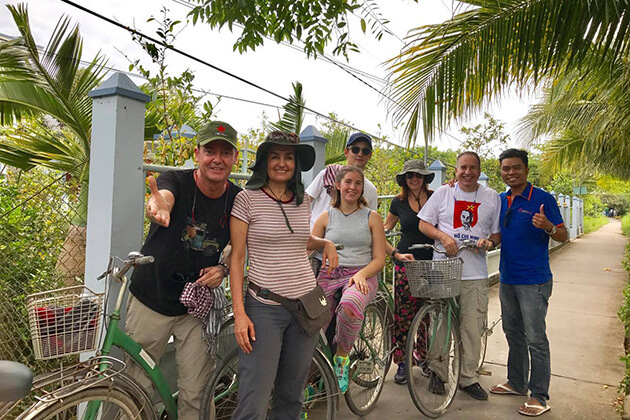 Explore the city by cycle tour along the banks of Perfume Rive, get more insights into a different religion by visit Thien Mu Pagoda or daily life of local people in Kim Long Village. Back to city center by car then transfer to fine and sophisticated mausoleums of Emperors Tu Duc and Khai Dinh – two of the eight famous Kings’ tombs of Nguyen Dynasty found along the Perfume River. Return to our hotel and the remaining day is at leisure. Overnight in Hue. Alternative tours are available in Hue. Take a scenic drive to Hoi An and pass through many breathtaking routes in the Central part which are Lang Co Beach, Hai Van Pass – one of the most magnificent pass in Vietnam (Ocean Cloud Pass) and Danang. During the trip, we can stop to visit Cham Museum – one of the most adequate collections of Cham Artifacts in the world if we want. Next, we also can set our foot on Ngu Hanh Son (Marble Mountain) including 5 limestone mountains rising on the beach to contemplate the majestic scenery of the city from the height of over 100m. Afterward, we arrive at Hoi An and check in our hotel. Located right next to Thu Bon River, Hoi An was a well-known town named Faifo where used to be a trading area of numerous businessman from Japan, China, Spain and Italy, etc. in 16th, 17th century. At that time, Hoi An had become a prosperous trading port, huge and crowded commercial zone of Southeast Asia and one of the main harbor of merchant ships in the Far-east. Many foreign traders chose this town as a second hometown to settle down then, built houses, temples and pagodas with typical style of their own native land. That mainly created the unique combination of culture and architectures from other countries like Japan or China in Hoi An. After that, due to unexpected events, Hoi An gradually was taken its favorable position from Da Nang port. However, what a blessing in disguise! Not being urbanized, Hoi An still mostly kept its tiny streets and alleys, tiled roof houses, ancient assembly halls and Japanese Covered Bridge, etc. 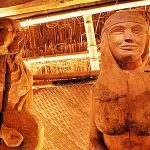 which are famous tourism sites attracting many tourists in nowadays. Hoi An is also famous for its sparkling and fanciful scenery of Lantern Festival associated with traditional handicraft for a thousand year. This festival annually takes place at nights in the middle month based on Lunar Calendar especially Mid- Autumn Festival and 7 nights of Tet Holiday are most monumentally organized. Cuisine is another highlights of Hoi An which can highly impress our senses. Have a rest before being warmly welcomed by our local guide for food tour starting in this late afternoon to get deep insights into Hoi An’ cuisine while traveling in an US military jeep. In the late afternoon, drive out of the town to a nearby beach to watch sunset, enjoy cold beer and tasty seafood with feet –in-the-sand style. Then, our driver will take us through rice paddies to a popular local eating sites to taste “banh xeo”- crispy Vietnamese pancake filled with beansprouts, prawns and pork. Back to the town when it gets dark, have a BBQ in a local restaurant for the main event of the evening: a traditional BBQ feast. Next activity is taking a stroll around the hustling and bustling streets of Hoi An. We also can enjoy eventful atmosphere in a local bar if we want or back to our hotel after finishing walking tour. 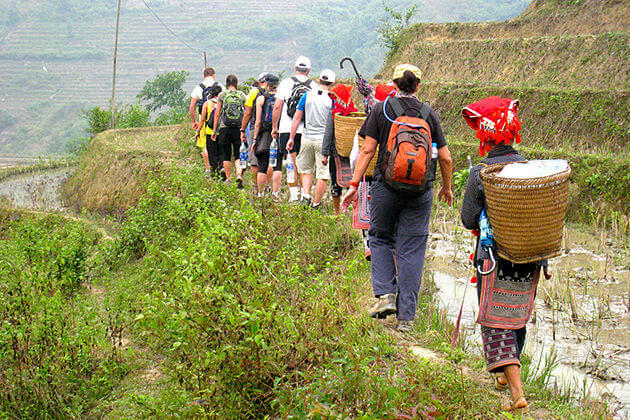 Our trip today departs from Cua Dau Bridge with local guide introduces us about landscape and people here. Pedal carelessly with gentle cycles, we will visit fishing hamlet of Duy Hai before see local people catch fish on small bamboo boats. Afterward, let’s enjoy the beauty of peaceful countryside on small paths along the rivers under coconut palms before stopping at Noi Rang Market to see eventful daily life of local people. The wheels continue rolling and take us to village of Kim Bong which is famous for very skillful residents at carpentry inherited from Hoi An ancient architectures. Spend the rest of the morning enjoying poetic beauty of Thu Bon River, have lunch on boat and relax ourselves. Transfer to Hoi An in the early afternoon. The remaining day is at leisure for us. Full day experience as a truly local fisherman at Hoi An. Owning over 2000 km of coastline, seafood plays a important role with Vietnamese people especially people in the Central Part. Here, fishermen still use traditional way with a micro-scale to catch enough seafood for their family in a day before get more for selling in the market. After watching daily activities of fishermen in the morning, we will spend the latter half of the day to learn about their craft before visit a nearby fishing village to Hoi An. Here, we will be taught specific steps of the process. Then, try controlling an unique bamboo basket boats, balancing it while throwing the nets. The tour today ends by enjoy warmly meal with local fishermen. Please note: This is a small-group, half day excursion. Our afternoon is at leisure. Depart from Hoi An to transfer to Danang Airport for our flight to Ho Chi Minh City. 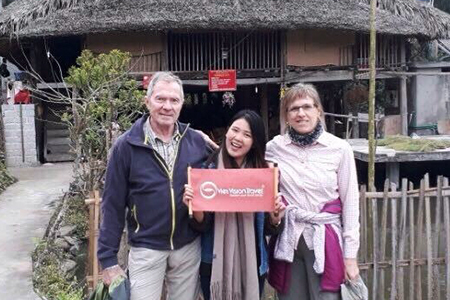 After arrival at Ho Chi Minh City, our itinerary today starts with our Local Tour Guide presents to us about one of the most well-known historical monument of Vietnam – Cu Chi Tunnel. Head to the northwest about 70 km from city centre, it takes an hour driving. 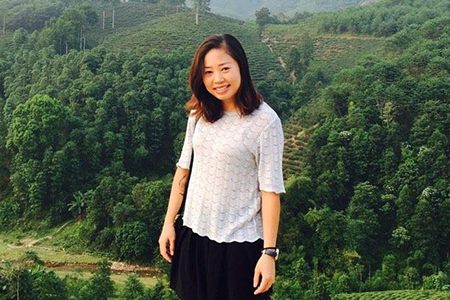 On the way, we can witness beautiful countryside landscapes with enormous rubber plantations and rice fields. Arrival at Cu Chi Tunnel, we spend a few minutes watching a short video introducing how the tunnel was built. 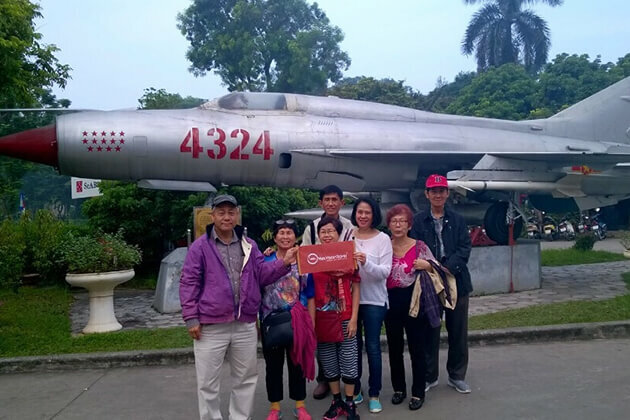 Afterward, we explore and see with our own eyes a secret underground system constructed by Vietnamese people in Indochina War and Vietnam War with the length of around 250 km. We can witness an US tank or numerous bomb holes made by 500lb bombs are remaining historical vestiges of a magnanimous period of time. Leave Cu Chi, our driver will takes us back to Saigon to check in our hotel and continue the itinerary. Considered as “A pearl of the Far-east” in the late 19th and the early 20th century, Saigon or Ho Chi Minh City (HCMC) renamed in 1976 has become one of the most eventful city of Vietnam. This city is the combination of classic and modern features with ancient French buildings coming between skyscrapers and crowed metropolitan areas. Our afternoon is at leisure until 6pm when we will explore this city on unique Vespas taking us to the most interesting sites of Saigon. At first, let’s enjoy a cocktail and appetizer in Café Zoom and watch hurry life of Saigon people. Next, our driver will take us through Chinatown, District 4 with crowed streets and small alleys to experience the night life of locals and enjoy tasty street food. The wheels keep rolling to take us to District 1 where we can taste Banh Xeo – fried pancake made from wheat, pork, shrimps, onions, etc. eating with typical sauce. The trip ends by enjoying Vietnamese acoustic music performance while have a drink at a cool coffee shop. NB: If the idea of a moped ride doesn’t appeal, we can easily switch the evening’s arrangements to your car. Additional tour ideas for Ho Chi Minh City. Full day sightseeing Ho Chi Minh City to discover its old and new beauty. We first starts with District 1 where we can be impressed by unique architecture like Basilica and neoclassical facades lying between Saigon’s most crowed wards. Then, lost in another side of Saigon when strolling through tiny alleys in the back, local markets and residential areas to get a different look from modern life out there. 1778 where we can find variety kinds of good on sale like dragon artwork, masks, pet fish, sacks of rice, fabric and cooking utensils, etc. and enjoy tasty noodle dish for lunch. Have a rest then continue visiting Quan Am Pagoda designed in Chinese style and built during the 19th century. Afterward, we transfer to newer developing areas and see a visual feast of old and new architecture side by side before visit the city’s tallest building – Bitexco. We will have free time to enjoy a sundowner (at our own expense) in the top of the building. After that, we can take a taxi to return to our hotel. 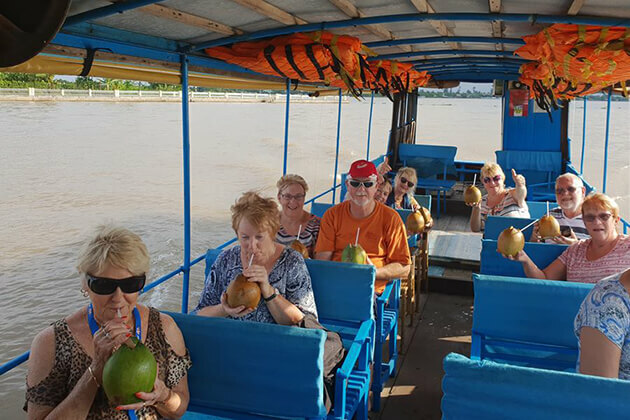 Head to the Southwest about 120km, we set foot on Cai Be Floating Market where we will board our private sampan – a typical kind of boat commonly used in Mekong Delta. This tour includes boatman, deckhand and a local guide. Begin the trip with a short visit to some nearby factories where we can see local people making rice paste, coconut candies and other specialties. Rowing the boat along the river, we will see one of the most eventful floating market in this region – Cai Be floating market where we can find various types of goods like fruits and vegetables. Interestingly, local people will hang their products on a stick in the boat to let customers know what they want to sell. 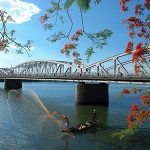 Disembark at Sa Dec town and stroll around the charming town to visit ancient French houses, Chinese temples, a central market and the home of Mr. Huynh Thuy Le – “the lover” in Marguerite Duras’s famous novel. Back to our sampan to move to Can Tho passing through narrow canals and wooden monkey bridges. Our boatman will takes us to further sites like Cao Dai Temple and some villages. Arrival at Can Tho in the evening, have dinner at a ancient house before take a sleep in the sampan. According to previous itineraries, we usually spend our morning to visit Cai Rang Floating Market and enjoy hustling and bustling atmosphere of early morning market about 15 minutes along the river. However, nowadays, to be honest, the market has lost a little bit its attraction, authentic features and gradually became a “hot-spot” like nearby markets to Saigon. After breakfast, we quickly transfer to Can Tho Airport for departure flight to Phu Quoc Island. When arrival, check in our hotel and we will have a full leisure day at Phu Quoc. Located in Gulf of Thailand and 45km far from Ha Tien to the West, 15 km far from the South coast of Cambodia. During the late 17th century, this island witnessed many fights to gain territories between Vietnam’s Emperor and other foreign aggression. 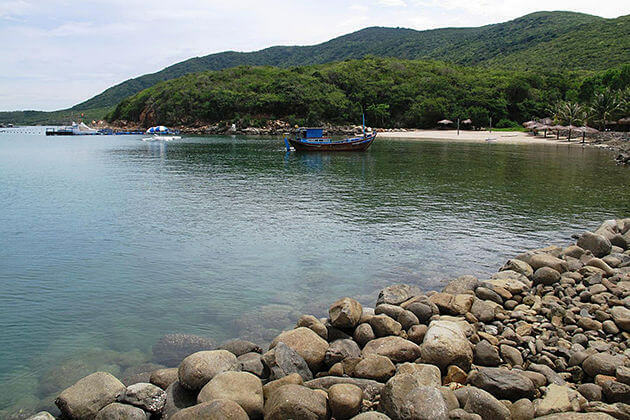 Nowadays, Phu Quoc Island is famous for its authentic beauty of nature with beautiful beaches and valuable ecosystem. Besides, fish sauce is a typical specialty of this island. The day is at your leisure until your transfer to Phu Quoc Airport for your flight to Ho Chi Minh City to connect with our onward flight to Adelaide in the evening.